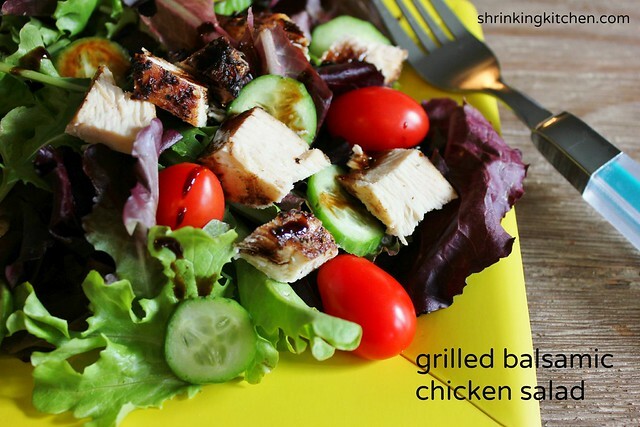 This grilled balsamic chicken salad is one of the best-tasting salads I’ve ever made. It makes quite a bit, so it’s perfect for a quick family meal. You could even toss all the ingredients into one big bowl, and bring it to a potluck or BBQ. This salad is truly easy enough for anyone to make — if you can work your broiler, you can make this meal. The balsamic dressing is added just before serving, so your organic mixed greens don’t get soggy. Salads with chicken always make me think of my mom; she makes a big salad, with grilled chicken on the side, almost every night. It’s a near-perfect salad, I think. Chock full of flavor, and all-natural, made with nothing but whole ingredients. It doesn’t get much cleaner than this, and I guarantee it will become a hot-weather essential. You can thank me later! Balsamic vinegar of your choice, for dressing. Our family especially likes white balsamic vinegar, and black currant balsamic vinegar. Place tenderized chicken breast halves in a shallow glass dish (preferably one with a lid). Pour balsamic vinegar and olive oil over the chicken. Sprinkle the chicken with sea salt and freshly ground black pepper. Cover tightly and refrigerate 4 hours. While the chicken cooks, thinly slice mini cucumbers. Cube cooked chicken into bite-size pieces. Divide evenly, and serve over organic spring mix, with cherub tomatoes and mini cucumber slices. Drizzle with the balsamic vinegar of your choice, and enjoy! * The long prep time is due to allow for marinating the chicken.